A razor blade, a bare belly, and blood seeping from the corners of a newly carved five point star. This is not the image I expected to associate with the elegant, well-spoken woman with a Slavic-tinted accent standing on stage before me; but, for Marina Abramović, the “grandmother of performance art,” this is an image she is proud to conjure. She has spent a lifetime cultivating it. Abramović this month spoke at Columbia University’s School of the Arts about her career and upcoming retrospective, “The Artist is Present,” at New York’s Museum of Modern Art (MOMA) this spring, which will include four continuous live recreations of her work and a new performance by Abramović herself. Unlike most of her brethren from the heyday of performance art in the 1970s and 1980s, who have either retired or moved on to other mediums of expression, Abramović still showcases her unique vision of using the body as both a subject and an object. Often attention-grabbing, provocative, and sometimes crude, Abramović entices audiences to shed their preconceived notions of what art is supposed to be and instead allow themselves to be taken into an experience of raw, unadulterated and often disturbing humanness. “Life is getting faster and faster,” Abramović often says, “so we absolutely have to make art slower and slower.” While it is difficult to make sense of Abramović’s work, for it follows no clear logic and presents itself in disjointed snippets of experience, it is distressingly easy to be subsumed by it. Naked, frail, and smack, two bodies collide and bounce off one another, the haunting hollow sound of the collision displayed on a projector radiates throughout the Columbia University auditorium. I and my fellow observers shift uncomfortably in our seats, staring at the film. The two figures climb to their feet, walk to opposite ends of the screen, turn, charge toward one another, crash, and once again go tumbling down. Repeat. Again. And again. And again. Watching this, I can’t help but flash on the old cliché that insanity is doing the same thing over and over, expecting a different result. I’m starting to feel a little sick. Disoriented. Confused. I look around and the audience is watching in exacerbated silence. This was only a short, two minute clip of a performance Abramović did in the 1970s with her partner for 12 years, Ulay, but it was just one of the many similarly disjointing videos we are exposed to over the two-hour presentation. Some of the most impossible to forget were: Abramović and Ulay naked, slapping one another with increasing intensity for 20 minutes; the pair thrusting screams at one another until their voices grow hoarse; and, particularly disturbing to me, when they join mouths and pass oxygen and carbon dioxide back and forth until one of them finally faints (it takes 19 minutes). Prior to her work with Ulay, Abramović performed solo. In one performance, she plays the game Five Finger Fillet, where she places her hand on a table, takes a knife and begins stabbing it between her fingers. She increases the speed, and the mistakes inevitably grow. When finished and bloody, she repeats the entire performance, attempting to recreate each movement down to every last mistaken slice of flesh. It was an experiment, she explains, to play with the perception of time by blurring the lines of past and present through repetition. She then shows us her most famous early piece, the “Lips of Thomas”, where, over a period of seven hours, she slowly carves a five-point star into her stomach, a performance she repeated live in 2005 at the Guggenheim. Almost 20 years later, her predication proved to be horrifyingly accurate when war and genocide engulfed her home country of Yugoslavia. Born to parents of Tito’s Communist Partisan fighters, and a grandfather who is now, literally, a saint, Abramović grew up in a contradictory and strict household in Belgrade, Serbia. Her parents allowed her to perform as she wished, but she had to be home by 10pm. “The worse childhood you have, the better the artist that can come out of it,” according to Abramović. As she shows us slides of her old family photos, I can’t help but notice her lack of smiles and the correlation to her artistic direction. Much of Abramović’s work revolves around tests of extreme physical endurance and pain because, she says, “the human being is afraid of two things: he is afraid of dying, and afraid of pain.” For Abramović, performance is a vehicle for looking into what makes us human, to strip down the complexity of the world around us, and to remind us to embrace the good and the bad of our human existence. Abramović’s work has been described as deep, psychological extremism; a seemingly accurate representation that would explain the growing intensity and discomfort it evokes within me as I watch this retrospective unfold. Bombarded with performance after performance – the sound of air passing through one person into another, the smack of flesh on flesh, lungs screaming for no other reason than just to be heard – these mundane, human sounds begin to take their toll. I want it to stop. I want to leave. I want to experience a feeling of humanness that is sanitized, dressed up in comforting layers of complexity and shadow. The air around me grows stale, the smell of sour dog’s breath emanates from the formally chatty but now intensely focused and silent crowd. When I first entered the auditorium, the crowd of mostly young, hip clichés of art students buzzed with conversation, cell phone chatter, and the munching of contraband snacks. The energy has now transformed to an uneasy, nervous intensity. I find myself constantly gawking, the question “why! ?” uttering uncontrollably under my breath, as I try to relax the muscles in my face that kept forming the look of disgust. Why would she do this? What would possess a woman to put herself through these unpleasant and sometimes downright horrible rituals? And in public, nonetheless? The shock and novelty of Abramović’s work has worn away, and what is left is an uncomfortable resonance. My mind is no longer having fun. I can’t rationalize or make sense of what is going on before me, because this “art” in no way fits within my notion of what art is supposed to be. When someone looks for art, what do they seek? Do you look for beauty? Do you want to be moved, inspired, surprised? I can bet that most of us don’t seek to be disturbed. Yet, this is precisely what Abramović does, and I can’t help but wonder if perhaps there is a deeper wisdom contained within her in work. Maybe we need to be disturbed. 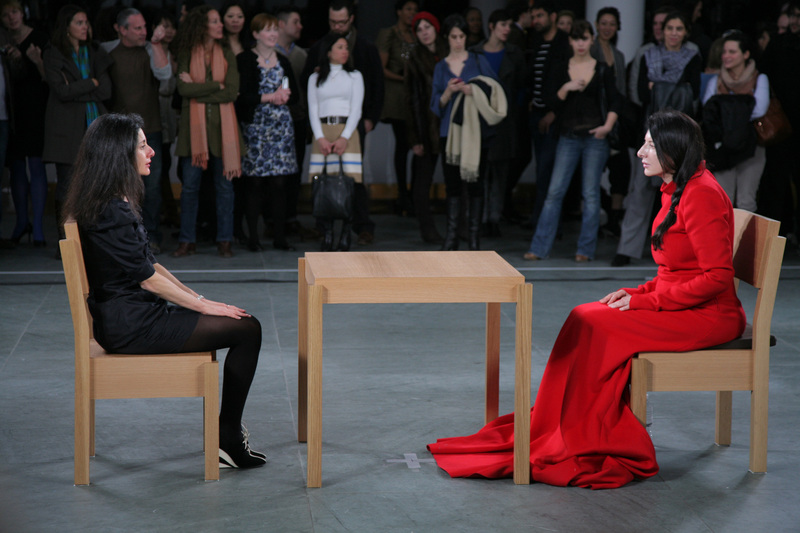 Abramović’s art strips the human being, often quite literally, to its most raw, basic elements. She does something which is rare in our society: she eliminates distraction. She takes away the tidy stories, the context, imagination and greater meaning imposed upon our daily actions in our search for significance. She introduces us to something primal, something visceral, the act of being human in ways which we no longer notice. She draws attention to breath by exposing us to the delicate balance of give and take, and she begs us to see the human body in all its strength and all its weakness as it collides and crashes with another. She forces us to confront the shadows lurking within each of us that, at their worst, can lead us to inflict pain and suffering on another with enjoyment and even amusement. In the end, she dares us to challenge the limitations of our own pain in our lives by witnessing a woman who uses performance to transform pain she would otherwise find unbearable in her daily life.